According to reports, Tesla may place their high performance power trains on mid-size to full-size pickup truck models. These power trains were originally designed for their Tesla S series. It appears the automaker is motivated to try their parts on established truck designs, before they build models of their own. 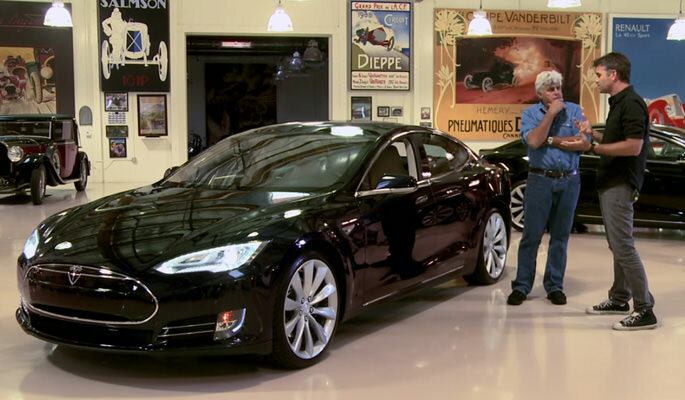 This smart and cost-effective maneuver by Tesla impressed Former Tonight Show host, Jay Leno. To show appreciation, Tesla is offering Leno one of their pickup truck projects to add to Leno’s collection of rare automobiles. On the side, Via Motors debuted a line of GM vans, SUVs, and full-size pickups that featured a 4.3L V6 engine. They also created a plugin electric truck that could run up to 40 miles on the electric motor, and over 300 miles on the V6. Moreover, these vehicles offer 110V and 220V power sources to run virtually any standard electrical device. Bob Lutz, a spokesman for Via, stopped by Leno’s incredible 100,000 square foot building to tape an episode of “Jay Leno’s Garage”. They were able to drive one of the VTrux and go over the various capabilities of the vehicle. Lutz was impressed by the overall performance and marveled at the potential of the fully developed vehicle. The future looks bright for Tesla, don’t you think? Express your opinion and leave your comment below! ScopioneUSA offers a wide variety of carbon fiber car accessories and auto parts for many different makes and models. Carbon fibre is a revolutionary material that is stronger and tougher than steel, but only weighs a fraction of the amount. In our extensive catalog, you can find carbon fiber spoilers, grilles, bumpers and more. We even offer custom modifications for many different individual vehicle parts – which include the hood, truck or lip. If you want quality carbon fiber parts for your vehicle at low competitive prices, shop at ScopioneUSA!